FILE SOURCE: MLNRV Hakaniemi 2010-05-03.JPG on the Wikipedia page Helsinki tram. 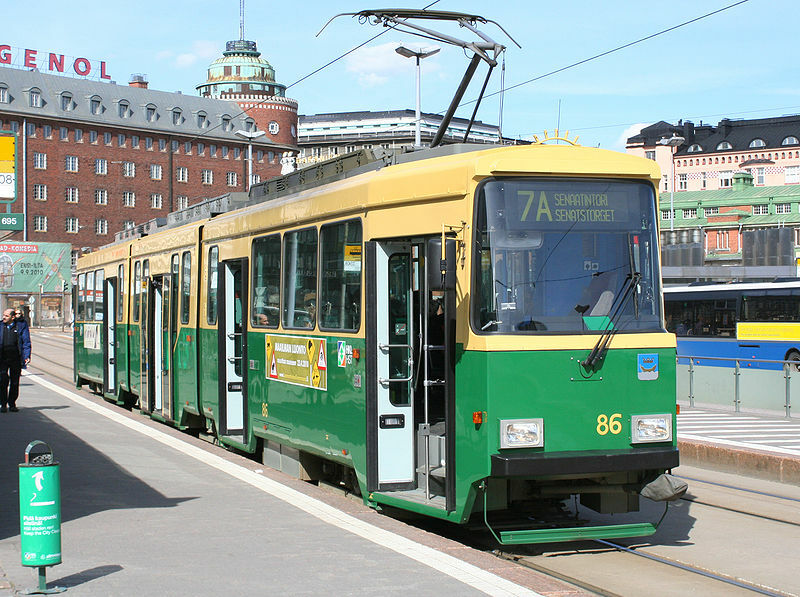 DESCRIPTION: A Helsinki City Transport -owned MLNRV-type tram (Nr II tram with an added low-floor midsection) in Hakaniemi, Helsinki on line 7A. The Nr II trams were built between 1984 and 1987 by Valmet in Finland, with the added sections built by Verkehrs Industrie Systeme in Germany and installed in Finland by HKL from 2006 onwards.